Kilteasheen (Irlande): Did zombies roam medieval Ireland? Two early medieval skeletons were unearthed recently in Ireland with large stones wedged into their mouths — evidence, archaeologists say, that it was feared the individuals would rise from their graves like zombies. The skeletons, which were featured in a British documentary last week, emerged during a series of digs carried out between 2005 and 2009 at Kilteasheen, near Loch Key in Ireland, by a team of archaeologists led by Chris Read from the Institute of Technology in Sligo, Ireland and Thomas Finan from the University of St. Louis. The project recovered a total of 137 skeletons, although archaeologists believe that some 3,000 skeletons spanning from 700 to 1400 are still buried at the site. The "deviant burials" were comprised of two men who were buried there at different times in the 700s. One of the men was between 40 and 60 years old, and the other was a young adult, probably between 20 and 30 years old. The two men were laid side by side and each had a baseball-size rock shoved in his mouth. "One of them was lying with his head looking straight up. A large black stone had been deliberately thrust into his mouth," Chris Read, head of Applied Archaeology at IT Sligo, said. "The other had his head turned to the side and had an even larger stone wedged quite violently into his mouth so that his jaws were almost dislocated," he added. Initially, Read and colleagues thought they had found a Black Death-related burial ground. Remains of individuals buried at the end of the Middle Ages with stones stuck in their mouths have hinted at vampire-slaying rituals. It was believed that these "vampire" individuals spread the plague by chewing on their shrouds after dying. In a time before germ theory, the stone in the mouth was then used as a disease-blocking trick. 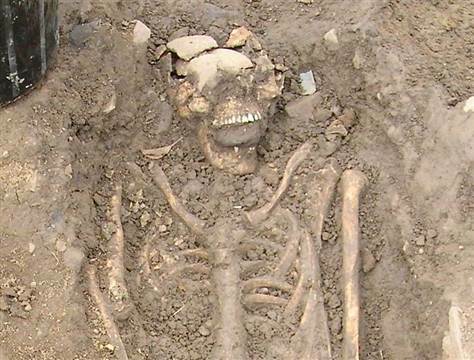 Since the vampire phenomenon didn't emerge in European folklore until the 1500's, the archaeologists ruled out this theory for the 8th-century skeletons. "In this case, the stones in the mouth might have acted as a barrier to stop revenants from coming back from their graves," Read told Discovery News. Revenants, or the "walking dead," tended to be people who lived as outsiders in society, according to Read. The two Irish men could have been considered potentially dangerous people, such as enemies, murderers or rapists, or they could have been ordinary individuals who died suddenly from a strange illness or murder. Anything outside the norm would have caused the community to fear that these people could have come back to life to harass their loved ones or others against whom they had a grudge. The mouth was seen as a key part of the body for such a transformation. "It was viewed as the main portal for the soul to leave the body upon death. Sometimes, the soul could come back to the body and re-animate it or else an evil spirit could enter the body through the mouth and bring it back to life," Read said. According to Kristina Killgrove, a biological anthropologist at the University of North Carolina, the burials' dating is particularly interesting as it appears to predate historical records on revenants. "I'm also intrigued by the fact that the two males were not buried at the same time but were nonetheless buried side-by-side in this non-traditional manner, which suggests these burials were not accidental or careless," Killgrove told Discovery News.